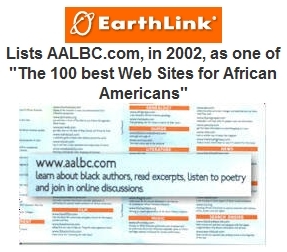 On April 4, 2003, EarthLink announced a partnership with MOBE (Marketing Opportunities in Business and Entertainment) to present The 100 Best Web Sites for African Americans. That partnership was apparently initiated to support an effort started by EarthLink who, in 2002, announced the first 100 Best Websites for African Americans. I learned of the list via an little tri-fold flyer I received in the mail (image on right) from EarthLink. There was nothing special about the mailing. There was no raised lettering, no embossed envelope or fanfare — just your average piece of junk mail that I would have normally thrown away were it not for the neat little list of websites. The EarthLink/MOBE effort did not last very long. The last record of the list I found was on EarthLink’s website from January 2006 (courtesy of the Wayback Machine). The Mobe website (mobe.com) has been out of commission since 2008 and was not updated after 2006. Another inactive site’s domain (black movie dot com) was reclaimed. by a pornographer. Of the 58 sites still alive, 5 have not been updated a very long time. One site not updated in a long time is Melanet.com “The Uncut Black Experience!” the site is over 17 years old and is one of first Black oriented websites I recall seeing. Many of the remaining websites don’t look very different from when they were launched, while others have kept up with the times and seem to be doing quite well. The sites do however have one thing in common, something to be proud of, they (we) have all withstood the test of time. Of course, since this list was first published in 2002, many things have changed on the World Wide Web. One change I’ve observed is that mission driven sites, like most of the ones on the list, are being supplanted by websites driven purely by profit. One consequence of the predominance of profit driven sites is the most popular “Black” websites are no longer Black owned and are controlled by huge corporate whose interests do not serve Black people very well. This results in the voices of independent Black owned sites being crowded out. Mission driven, Black owned sites exist — they are just harder to find. This is one reason I launched a new search engine called Huria Search. To read more about why I created Huria Search, click here. Below is the last version of the The 100 Best Web Sites for African Americans. I believe it is from 2006. I wonder what websites would be included on a 2012 list and who would own them?